The Philippines has a rich and complex history that is colored by practically as many different cultures as there are islands. A guy I used to work with used to love telling me about his favorite professor in college, who gave a final exam with only one task: de-colonize colonialism. In other words, deconstruct the culture, the traditions, the idiosyncracies that make the country what it is. Remove all of the external influences that have resulted from the different occupations – the Malaysians, the Spanish, the Americans, and the Japanese. What do you get? I don’t know, but it would look nothing like what the Philippines is today, which is a rich tapestry of traditions that have been shaped by its history. 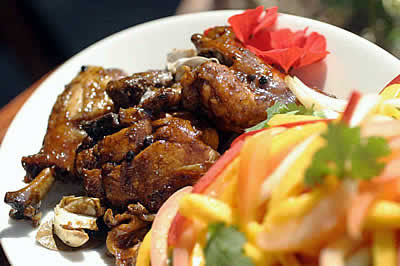 It is the national dish, many Filipinos say: protein braised in vinegar until pungent and rich, sweet and sour and salty at once, sometimes crisped at the edges in high heat, always served with the remaining sauce. Its excellence derives from the balance of its flavors, in the alchemy of the process. Cooking softens the acidity of the vinegar, which then combines with the flavor of the meat to enhance it. Some serve the dish as a stew. There are those who call for broiling the meat at the end, to caramelize it and provide a crisp texture alongside the sauce. Others advocate pan-frying. Some demand deep-frying. Or grilling. So the next time you go the Philippines, or hang out with Filipinos, or go to a Filipino or trendy Asian fusion restaurant that is avant-garde enough to feature chicken adobo on the menu, ask them how they make it. Hopefully, it will be a window into their lives.